“Father” Dix had a long and successful career at scrum half for Gloucester, making 235 appearances between 1907 and 1922. He was renowned for his noisy encouragement of the Gloucester pack, and for his reverse pass, which was regarded as a masterpiece and earned a tribute from W J A Davies in his book on Rugby Football. “Father” was capped by Gloucestershire, and also played in international trials, but he never quite gained the honour of playing for his country. He was always referred to as “Father” Dix, although he never explained how he came by this nickname, and even his closest friends claimed not to know. John William Dix was born in Gloucester in 1884, the son of a general labourer. In his childhood, he lived in Suffolk Street, although he later moved to 1, Colletts Yard, where he lived with his wife, Ellen. By 1901 he had left school and was working as a fettler in an iron foundry before joining the Gloucester Railway Carriage and Wagon Company Ltd. He continued to work there all his life except for his period of military service during the Great War and also in the Second World War when he was posted to another factory as part of the war effort. He played his early rugby with the St Mark’s Club, before moving up to the Gloucester Club, for whom he first appeared in the first team in 1907-08, when he deputised at scrum half for Dai Gent. “Father” was not able to make the position his own until Gent moved to Plymouth in 1910, although he enjoyed a fair number of opportunities to stand in for Gent, who was an England international and often absent on representative duties. “Father” played his first game for Gloucester at Exeter on 9th November 1907, and scored a try in a 13-6 victory. He scored a further try against Plymouth, and added a dropped goal against London Welsh, before running in a hat trick of tries towards the end of the season against Lennox. By the end of the season he had made 17 appearances and registered 5 tries. For the next two seasons, “Father” continued to play in the shadow of Dai Gent. In 1908-9 he made 12 appearances and scored 5 tries. On 7th November 1908, he enjoyed the distinction of scoring a try in a sensational 11-3 win at Northampton, which took away the home side’s unbeaten record. He also played his first game for the County on 24th December 1908, and scored two tries for Gloucestershire in their 39-0 defeat of Racing Club de France at Kingsholm. However, he was replaced by Gent for the County Championship matches. 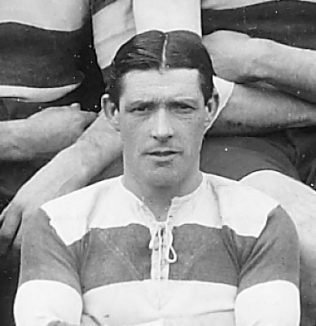 “Father” was almost ever present in the Gloucester side for the 1912-13 season, playing in 37 of the Club’s 40 fixtures (more than any other player). Unfortunately one reason for this was his failure to be selected for the County side which won the Championship that season. The County’s loss was Gloucester’s gain – he contributed 5 tries for his Club (3 of them against Stroud), and kicked the first two conversions of his career (Hamblin and Cook normally took the kicks at goal). WB recognised his overall value to the side in his end of season summary: “To the fine work of W Dix at half-back Gloucester owed much, and if anything had happened to the clever scrum worker to keep him out of the team for any length of time the club would have been in dire straits, for there was no deputy to call upon with any pretensions to first-class football. In the early matches Dix was associated with his old partner, W Hall, and the pair were playing as well as ever together when the unfortunate disagreement occurred which ended Hall’s connection with the club; whether the break is only temporary remains to be seen,” (it was – Hall went North and signed to play Rugby League with Oldham). For reasons which have not been recorded, “Father” dropped out of the side in 1913-14, along with Arthur Hudson, Billy Johns and Gordon Vears, and played only in the last 2 fixtures – at Kingsholm against Cinderford and away against Bath. The First World War then brought an end to rugby at Kingsholm for 5 seasons. “Father” Dix joined the 8/Gloucesters and landed in France on 18 July 1915 – several other players were in the same battalion including John Robinson and Harry Cook. Along with about thirty members of his battalion he was taken prisoner on 18th April 1918 and as the British advanced, beginning on 8th August, the Germans moved their prisoners back towards Germany. On 11th November the prisoners were near the Dutch border at Turnhout. Dix was freed and back in Gloucester by December and played in the Club’s Christmas matches which were organised to show that the country was returning to normal. “Father” reclaimed his place in the Gloucester team when fixtures resumed in 1919-20, he played better than ever, and his rugby career flourished. He and Tom Millington developed a superb understanding at half-back, and were regarded as one of the best combinations in the country. Indeed, season 1919-20 was perhaps the highlight in the career of this grand little player, but also provided the biggest disappointment. Selected for the Rest in an England trial match, he was chosen as the reserve to Kershaw for all four internationals, and was a travelling reserve at Dublin and Twickenham. Kershaw, on the injured list, was doubtful for the latter match, and 20 minutes before kick-off he had not put in an appearance at the ground. Dix’s hopes of getting an international cap rose appreciably, and he was told to prepare to turn out. A few minutes later Kershaw arrived, reported himself fit to play, Dix’s greatest ambition was shattered, and that was the closest he ever came to representing England. However, Dix and Millington were at the heart of the famous Gloucestershire side which won the CountyChampionship in three successive seasons – 1920, 1921 and 1922. Their brilliant pairing was a major part of these triumphs, and set the tone for a series of delightful displays of open rugby by the County side. In 1919-20, the season’s achievements were crowned with Gloucestershire’s triumph in the County Championship Final, when Yorkshire were beaten at Bradford by the decisive margin of 3 goals, 4 tries (27 pts) to 1 try (3 pts). No fewer than nine Gloucester players were included in the victorious team (Hudson, Webb, Dix, Millington, Halford, Smart, Hall, Ward and Ayliffe). In that match at the Lidget Green ground, the Gloucestershire back division fed by the lively Dix excelled in all departments, even under the handicap of having Hudson and Webb injured during the game. Hudson had the honour of captaining the side in a fitting close to a brilliant career, for he did not play again owing to the serious damage which he suffered to his shoulder. The 1920-21 season saw “Father” win further representative honours, but he managed to play in 31 of the Club’s 37 fixtures, in what was a remarkably successful season. The team went through the season undefeated at Kingsholm, and registered wins over each of the four big Welsh clubs (Newport, Cardiff, Swansea and Llanelly), a rare feat achieved only once previously by Gloucester in 1898-99, and only once by another English club, Devon Albion. “Father” contributed a dropped goal in the 10-0 defeat of Swansea, a try in the 12-9 defeat of Newport, and a try in the 11-8 defeat of Llanelly. 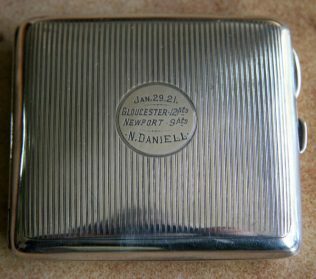 Newport arrived at Kingsholm with an unbeaten record after 25 matches, and ten internationals in their team, so their defeat was regarded as the greatest triumph of the season, and, following an appeal in the Citizen, funds were raised to provide a souvenir for each of the players, which took the form of an inscribed cigarette case. “Father” played right through Gloucestershire’s triumphant CountyChampionship campaign, scoring tries in the first match against Devon and in the semi-final against Surrey. The final was played at Kingsholm on 10th March 1921, when the Gloucestershire side containing 9 Gloucester players swept Leicestershire aside 31-4 (the gate for this game at £1011-8-0 was a record for the ground). He was also selected again to play for The Rest v England in the final international trial and scored their only points with a try in the 14-3 loss (Tom Voyce of Gloucester also scored a try for England in this match). This earned “Father” selection as a travelling reserve for the first two internationals against Wales and Ireland, but when he was again asked to attend in the third international against Scotland in Edinburgh, he declined, preferring to turn out for Gloucester against Llanelly. He was again selected for The Rest in the final international trial, but again failed to obtain that elusive England cap. He also played throughout the County season, scoring tries against Somerset and Cornwall in the group stage. In the semi-final, Gloucestershire fought out an 8-8 draw with Surrey at Richmond, but won the replay at Kingsholm 30-0, with “Father” scoring 2 tries and kicking 3 conversions in what was described as a brilliant display. The final was played at Villa Park, Birmingham, against North Midlands, and Gloucestershire romped home 19-0, for their third successive championship. Nine Gloucester players took part, and “Father” scored a try in what was to be his last game for the County. With “Father” deciding to call it a day at the end of the 1921-22 season, WB wrote an appreciation of him in the Citizen: “W Dix, the popular city and county half-back has definitely made up his mind to retire from active participation in the game, and his resignation has been in the hands of the Gloucester FC secretary for some two or three weeks. The announcement will be received with general regret, for though one fully recognises Dix has had a long playing career, his form in his last match – against Bradford on Easter Monday – was anything but suggestive that his football days were over. The veteran, however, feels that he has had enough, and that he should stand aside for a younger player. In fact, “Father’s” rugby career did not end until the following season, 1922-23 – he was persuaded to play on, but early on he developed leg trouble, and finally retired on medical advice, after only 5 games, 2 tries and a final conversion. His last game for the Club was at Cheltenham on 4th November 1922. His career record for the Club was played 235 games, during which he scored 53 tries, 10 conversions, 1 penalty, 8 dropped goals and 214 points. For the county he made 20 appearances, scored 8 tries, 3 conversions and 1 dropped goal, and figured in three championship finals, winning them all. WB organised a testimonial in the Citizen “in recognition of “Father’s” outstanding services to Gloucester football,” and sufficient was raised to give him several presents at the Club’s AGM in 1923. In later years, “Father” always received a warm welcome when he returned to Kingsholm, the supporters recalling fondly his many clever moves. Dix was also popular amongst his fellow players, even though he was known for ranting at his forwards in fairly colourful language if they failed to heel the ball as smartly as he wished. Indeed his approach to the game is perhaps exemplified by an incident in a match in London. He had gained the reputation of not strictly keeping to the rules in putting the ball into the scrum, and before the match started the referee was advised by the home crowd to “Watch Dix!” Whether this influenced the referee or not, he had decided to keep control, but was surprised by the outcome. At the first scrum, Dix collected the ball to put in, and as soon as he went to do so, the referee blew his whistle and shouted “free kick”. But “Father” had not released the ball: he had sold a dummy. Dix was seen grinning broadly behind the official, and no offence had taken place, but the referee insisted on the free kick being taken. “Popularly known as “Father” Dix, Mr John William Dix, of 4, Clarence Row, Alvin Street, Gloucester, one of Gloucester’s best-known Rugby footballers, died on Wednesday at the age of 59. Gloucester bred and born, he played for the City and the County, and figured in international trials, but he never gained the honour of playing for his country. 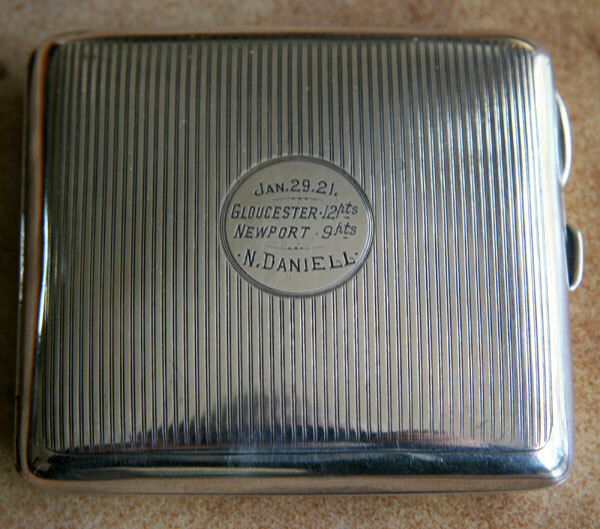 Nearly all his working life was spent as an employee of the Gloucester Wagon Works, except for his service in the last war, and during this war when he worked at another local factory. He became ill last June, but was able to return to work. Three months ago, however, he was again taken ill and had been away from work ever since with heart trouble. This is facinating, “Father Dix’s” wife Ellen (Ellen Elizabeth Hill) was my Great grandmother’s (Edith Hill) sister. Playing for Gloucester, fighting in the Great War then returning to play for Gloucester makes him a Gloucester legend. Indeed he is a Gloucester Legend, and a place has been reserved for him in our third book, currently being written, on Gloucester Players. This won’t be published until next year, after our “Representative Matches” book.